It's almost a given that when you see the Fisher Price Beats Bo robot toy in action, the inner child in you will want to dance and sing right along with him. He's such a cute interactive toy that it's hard to resist this this kind of enthusiasm. Adults will have to yield to babies and toddlers, though because the toy is aimed at ages 9 months to 3 years. Little Beatbo won't just have children in giggles and doing their own version of "hip hop," this spunky robot will teach your child the ABCs as he sings them the ABC song. So your child will get in some hot physical activity as well as fun learning experiences. Beats Bo has a lot of tricks up his sleeve, or rather his tummy.When a child pushes on the robot's multicolor LED belly or on the top of its large blue feet, the interactive fun begins. Beats Bo will sing funny songs that will make him want to dance as he learns. He'll learn basic things like the ABCs and different colors plus how to do simple counting. There are three different interactive modes that come with the toy.You can adjust hese modes according to the age of your toddler. As the child gets older, the content he'll hear will adjust to his age. Toddlers love hearing things played back to them that their parents say. It's an excellent way to teach them language skills. The bright flashing colors help children learn the names of colors. Toddlers will enjoy pushing the bright-colored flashing lights and getting a reaction with either a sound or movement. It encourages toddlers to sing and dance and you’ll get a lot of fun watching the two together. 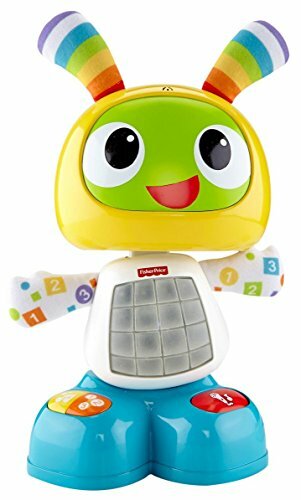 The Fisher Price Bright Beats Dance And Move BeatBo helps prepare toddlers for learning and preschool. The toy is lots of fun and the whole family will love Beatbo. This toy is the perfect choice for a parent who wants their child to be active and have fun while learning. Parents will love the way Beats Bo engages toddlers in fun learning experiences. It's an excellent purchase choice and makes great Birthday and Christmas gifts as well. ​Click below to buy the Fisher Price Beats Bo toy now.